Kevin was active with the Moray Youth Theatre throughout his childhood and adolescence, starting with them at the age of 11 and, prior to this, doing the occasional school play. His first job was that of the lead actor's understudy in "Oliver!" (Elgin Town Hall on Thursday 4th and Friday 5th of October 1984 tks to Louise Grant facebook) and he then went on to do quite a few musical productions with the group. Jean McIver, former director of Moray Youth Theatre, cast McKidd in his first role in a production of Anne Of Green Gables performed at Elgin Town Hall in 1987. On the university years: "I was one of the first people in my family to go to university, and that was a big thing, but I hated engineering, and after two months stopped going to lectures and joined the Edinburgh University Theatre Company." 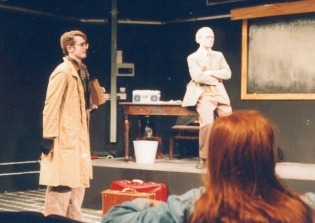 After a year, McKidd dropped out formally and did three years of drama school at Edinburgh's Queen Margaret University. Kevin talked about this Germanic stage movement on Jay Leno's "Tonight Show" interview in 2007. When the group ran out of colored stage makeup, they painted themselves with blue paint and, subsequently, Kevin had a bad case of lead poisoning. Edinburgh University improv outfit, the Improverts, where such luminaries as Kevin McKidd (Trainspotting) and Miles Jupp (Balamory) cut their teeth. Kevin did the London stage production of "Britannicus," for which he won the Ian Charleston Award. He played the title role in "Britannicus" at the Albery Theatre for the Almeida; shortly thereafter, the production transferred to New York's Brooklyn Academy of Music for two weeks. It was during this brief stay in New York City that Kevin proposed to his wife Jane. During 2007, Michael "Tuba" McKinsey premiered six new shows! The first, Lucy Simon's "Zhivago" took Michael across the Atlantic to London. Performing alongside Kevin McKidd (NBC's "Journeyman", HBO's "Rome"), Chris Sarandon, Jason Danieley, and directed by two-time Tony Award winner Des McAnuff, Michael debuted the role of the Kossack Commander for British audiences. With a lush and dramatic score by Tony Winner Lucy Simon ("Secret Garden"), and book based on the classic novel by Boris Pasternak, "Zhivago" seems Broadway bound. Doctor Zhivago the musical is coming to London next year, based purely on the Boris Pasternak novel, not David Lean's movie. And no, it won't feature Maurice Jarre's famous Lara's Theme. Des McAnuff, in London doing the final casting for London production of the great Jersey Boys musical, told me he has been working for five years with composer Lucy Simon and lyricists Michael Korie and Amy Powers. A work-in-progress version was done in California and Kevin McKidd took part in a rehearsed reading over here, but the London show that previews next October is a world premiere. "You'd need four nights to get the whole novel in," McAnuff joked, so the piece covers the Revolution and runs till the Twenties, concentrating on five main characters, Zhivago, Lara, Tonya, Komarovsky and Pasha. Producer Andrew Fell is in talks with owners of large theatre houses, but no deals are likely to be struck till the New Year. Expected in London late 2008. Sunset Song by Lewis Grassic Gibbon (1901 - 1935) remains one of the most evocative works of Scottish literature. Its themes of constancy and change, seen through the eyes of central character Chris Guthrie, are often considered a metaphor for the state of Scotland itself. M radio production by Thea von Harbou and Fritz Lang. A poem by Alexander Pushkin, published in 1820.